That simple gesture began the welcoming of Archbishop Joseph W. Tobin as the sixth archbishop of Indianapolis. On Dec. 2, Archbishop Tobin, Archbishop Carlo Maria Viganò, apostolic nuncio to the United States, and two deacons approached the front door of SS. Peter and Paul Cathedral in Indianapolis. 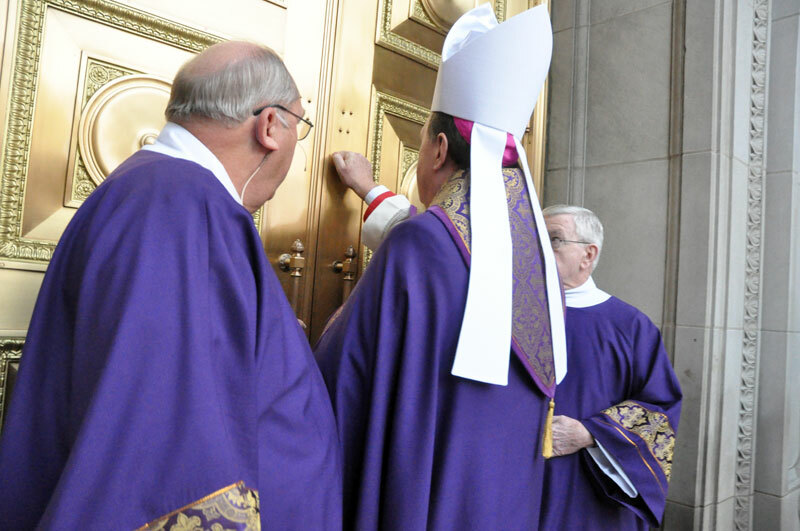 Vested in a violet cope in preparation for the praying of Evening Prayer II for the First Sunday of Advent, Archbishop Tobin ritually knocked on the large brass door. Father Noah Casey, rector of the cathedral, welcomed Archbishop Tobin when the door was opened and he entered. Father Casey also offered a crucifix for Archbishop Tobin to venerate. Next, the archbishop blessed himself and those around him with holy water. Gathered in the cathedral’s vestibule to welcome Archbishop Tobin were Bishop Christopher J. Coyne, apostolic administrator, and members of various Catholic fraternal organizations in central and southern Indiana. In his homily during the Evening Prayer liturgy, Bishop Coyne compared the welcoming of Archbishop Tobin at the door of the cathedral to similar rituals that take place during an infant baptism, the welcoming of a new catechumen and the welcoming of the remains of a deceased person at the start of funeral rites. Bishop Coyne assured Archbishop Tobin of the strength of the faith of the Church in central and southern Indiana. Bishop Coyne later addressed the hundreds of priests, deacons, religious and lay Catholics from the archdiocese who filled the cathedral. Following the homily, Archbishop Tobin made a profession of faith and took an oath of fidelity to the Holy See. Later in the liturgy, Archbishop Viganò blessed a new miter, crosier, episcopal ring and pectoral cross given to Archbishop Tobin as gifts from the priests and deacons of the archdiocese. Bishop Coyne was also surprised when he was given his own new episcopal ring. Since his ordination as a bishop on March 2, 2011, Bishop Coyne had worn Cardinal Joseph E. Ritter’s episcopal ring. Archbishop Tobin thanked Bishop Coyne for his ministry in the archdiocese during the past 18 months, and the congregation gave him a standing ovation. Father Jeffrey Godecker, chairman of the archdiocese’s Council of Priests, said after the liturgy that he was pleased to see Archbishop Tobin receive his new insignia, which were gifts from archdiocesan priests and deacons. He also noted that they will likely stay in the archdiocese for the use of future archbishops. Helen Deppe, a member of St. Bartholomew Parish in Columbus, was a representative of the Daughters of Isabella at the liturgy. She enjoyed being able to pray with her new archbishop. In remarks at the end of the Evening Prayer liturgy, Archbishop Tobin expressed gratitude that it occurred on “the evening of the first day of the week,” the same time that the Apostles on the first Easter encountered the risen Lord. “And so on the evening of the first day of the week, the Lord forges among us a new bond, a bond that is to recognize the Lord among us, a bond that leads us to an audacious gesture of lighting candles, even as the sun disappears, because we know who is the Light of the world, the Light of our hearts and the Light of the Church of Indianapolis,” Archbishop Tobin said. “Together, we will remind each other of that. And our hearts will burn. And we will recognize him in the breaking of the bread.